In particular, the scientists studied a key communication system called "Notch," which is used in nearly every tissue in animals. Malfunctions in the Notch pathway contribute to a variety of cancers and developmental diseases, making it a desirable target to study for drug development. Cells carry out their conversations using specialized communication molecules called ligands, which interact with corresponding molecular antennae called receptors. When a cell uses the Notch pathway to communicate instructions to its neighbors—telling them to divide, for example, or to differentiate into a different kind of cell—the cell sending the message will produce certain Notch ligands on its surface. These ligands then bind to Notch receptors embedded in the surface of nearby cells, triggering the receptors to release gene-modifying molecules called transcription factors into the interior of their cell. The transcription factors travel to the cell's nucleus, where the cell's DNA is stored, and activate specific genes. The Notch system thus allows cells to receive signals from their neighbors and alter their gene expression accordingly. 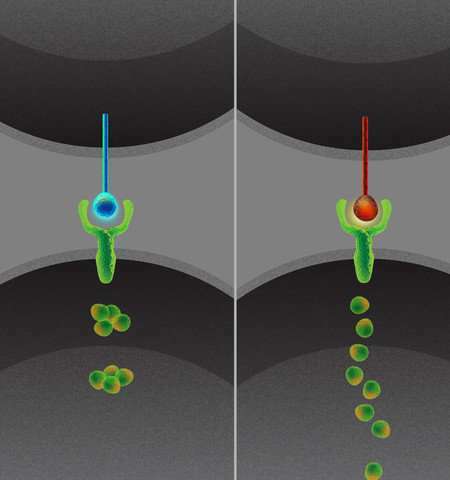 "At first glance, the only explanation for how cells distinguish between two ligands, if at all, seems to be that they must somehow accurately detect differences in how strongly the two ligands activate the receptor. However, all evidence so far suggests that, unlike mobile phones or radios, cells have much more trouble precisely analyzing incoming signals," says lead author and former Elowitz lab graduate student Nagarajan (Sandy) Nandagopal (Ph.D. '18). "They are usually excellent at distinguishing between the presence or absence of signal, but not very much more. In this sense, cellular messaging is closer to sending smoke signals than texting. So, the question is, as a cell, how do you differentiate between two ligands, both of which look like similar puffs of smoke in the distance?" Nandagopal and his collaborators wondered whether the answer lay in the temporal pattern of Notch activation by different ligands—in other words, how the "smoke" is emitted over time. To test this, the team developed a new video-based system through which they could record signaling in real time in each individual cell. By tagging the receptors and ligands with fluorescent protein markers, the team could watch how the molecules interacted as signaling was occurring. "Cells speak only a handful of different molecular languages but they have to work together to carry out an incredible diversity of tasks," says Elowitz. "We've generally assumed these languages are extremely simple, and cells can basically only grunt at each other. By watching cells in the process of communicating, we can see that these languages are more sophisticated and have a larger vocabulary than we ever thought. And this is probably just the tip of an iceberg for intercellular communication." The paper is titled "Dynamic Ligand Discrimination in the Notch Signaling Pathway." Excellent research here that opens a whole new field of multi dimensional complexity in cellular communications.